OH YES, … MY TEETH STILL NEED TO BE BRUSHED! Brushing our teeth is often quite bothersome - for young and old alike. And usually it has to be done when you don't have the time and you don't really fancy it either: You need to rush off to work and school or it is late and you want to go to bed and feel too tired to brush your teeth. Strenuous, bothersome and very understandable. perfect conditions for plaque, bacteria and calculus to work on enamel and gingiva all night long. An almost ideal situation for the rapid increase of germs that can then cause gingivitis and tooth decay. And that will mean: Ouch!. And making that dental appointment you don’t really fancy! We dental artists know how it goes at your home. But it could all be so easy because nowadays tooth decay, periodontal disease and the pain accompanying them could be avoided on a life-long basis. And our complete mouth-scaling will easily complete the job and clean whatever you don't reach at home with your toothbrush and toothpaste, etc. All you have to do is open your mouth for about an hour, once or twice a year, in a relaxed atmosphere, with a few breaks in between, and you will never have a toothache again. During a complete mouth-scaling we clean your interdental spaces and those areas of your mouth you can't reach with your toothbrush. 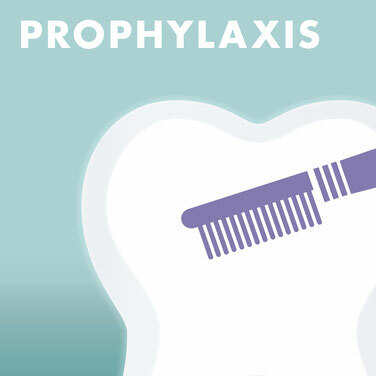 After an in-depth consultation, all hard and soft bacterial plaque is removed thoroughly and carefully - a great prophylaxis and wellness for your teeth. And when there is nothing to become infected any more, you can no longer develop tooth decay or periodontal disease. Good-bye, toothache! Good-bye, dental fear! Afterwards, the grooves in the chewing surfaces of your teeth can receive a fissure sealing, a protective coating that keeps bacteria out, so your teeth will remain cleanfor as long as possible. PLEASE, CALL US IN ADVANCE TO MAKE AN APPOINTMENT FOR YOUR COMPLETE MOUTH-SCALING.